Cabinet okays massive call-up, signalling imminent ground offensive. Air strikes kill five, including senior Hamas commando. The Security Cabinet has approved IDF Chief of Staff Lt. Gen. Benny Gantz's request to call up 40,000 reservists to the Gaza border, in the clearest signal yet that the IDF is planning a ground offensive into the Hamas-controlled territory in response to ceaseless rocket-fire on Israeli civilians. "We have been instructed by the political echelon to hit Hamas hard," chief military spokesman Major General Moti Almoz told IDF Radio earlier, saying the operation would take place "in stages." "We are preparing for a campaign against Hamas, which will not end in just a few days," he said in a statement after meeting security chiefs, which defined the aim as being "to exact a very heavy price from Hamas." "We will not tolerate rocket fire on Israel cities, and we are preparing to expand the operation with everything at our disposal to strike Hamas," he said. The IDF said that three terrorists were killed Tuesday when an Israeli aircraft attacked a vehicle in central Gaza. The IDF Spokesman said that the IDF and Israel Security Agency (ISA, or Shin Bet) attacked a vehicle in which a Hamas terrorist named Mohammed Shaaban, 24, of Jabalya, had been traveling. Shaaban is a trainer and commander of Hamas's naval commando force in northern Gaza. Two other people were inside the vehicle when it was struck, the IDF said. As of Tuesday afternoon, less than 24 hours into the operation, the IDF has attacked about 90 Hamas targets, including buried launchers, attack tunnels, launching arrays, training camps and other terror activity sites. The cabinet has approved the callup of 40,000 or 45,000 reservists as part of Operation Protective Edge. Most of these will replace mandatory-service soldiers in various routine security jobs, so as to free up the younger soldiers for Protective Edge operations. 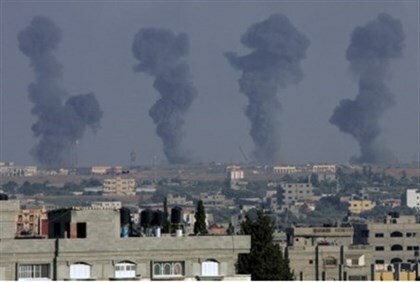 About 60 rockets were fired at Israel from Gaza since the morning hours Tuesday. Diplomatic sources said Tuesday morning that Prime Minister Binyamin Netanyahu has told the security establishment to prepare for a protratcted, serious and aggressive campaign against Hamas, and “to be prepared to go all the way” if necessary, in his words, in order to restore quiet to Israel's south. In a security consultation at Tel Aviv's Hakirya district, with the prime minister, defense minister and other senior officials present, various operational options were discussed, including a ground offensive. "Entry on the ground is one of the options that was discussed,” said the diplomatic source. The objective, he said, is to make Hamas pay a heavy price and create a meaningful offensive that will bring about deterrence. In the course of the last 24 hours, the prime minister spoke with world leaders and updated them on the situation. "Four people were killed in a Zionist strike on a civilian car in the Daraj neighbourhood in the center of Gaza City," a Hamas emergency services spokesman said. A total of 29 Palestinian Arabs were injured on Tuesday, two of them seriously. Early on Monday, three Palestinian terrorists were killed in a series of raids across Gaza. Two of them belonged to the Popular Resistance Committees and one was a member of Hamas. At the same time, another five Hamas terrorists died and a sixth was left in critical condition when a tunnel collapsed on them near the southern city of Rafah. Hamas blamed Israel, but the military denied conducting a raid in that area and blamed the deaths on the militants mishandling their own explosives. The IDF released on Tuesday black and white video footage showing missiles fired by the IDF Navy, and scoring hits on thre targets – Hamas training facilities in southern and central Gaza, as well as a training facility of the “Al Aqsa Defenders” in northern Gaza.